Lynn and I went back to Lake Louisa State Park last weekend and spent a very relaxing couple of days. It was a little chilly – our first Florida “cold” front rolled through while we were there and made us both appreciate the gas fireplace in the cabin. We didn’t see as much wildlife this time, but I did enjoy making some photos. Here’s one at sunset from just behind the cabin, looking out over Lake Dixie. I like the way the field glows in the light coming through the trees. The sky was very clear after the cold front, so there were no dramatic clouds to work with. I think the low morning sun on the trees and the mist on the water look nice in black and white. There weren’t as many flowers blooming as there were last May. But the few we did see were lovely. These were along a path just off the road. Lake Louisa is a wonderful, relaxing getaway in Clermont, Florida – very close to Orlando. If you haven’t been, check it out. My full writeup on the park is at this link and this set on Flickr has many more photos I made there. When I wrote about Lake Louisa State Park a couple of weeks ago, I didn’t know about 5 Mile Road. It’s just across US 27 from the Park. When I did hear about it, I drove back over to take a look. I made these photos on May 21st. One of my Flickr friends told me he visited the Burrowing Owl nest on the 26th and it looked abandoned. That’s sad. I’m not sure what happened. Maybe the chicks fledged and flew off. That’s what I want to believe anyway. If you visit Lake Louisa, 5 Mile Road is worth checking out too. You can find more photos from there in in this set on Flickr. Update (5/30/14): See this related post on 5 Mile Road. Lynn, Mary, and I spent the first weekend in May at Lake Louisa State Park (LLSP). It’s located just southwest of Orlando in Clermont, Florida. LLSP is 4500 acres of rolling hills including six lakes with 105 acres of shoreline. There’s a range of camping options and 20 very nice, two bedroom, furnished cabins that you can stay in. Activities include fishing, canoeing and kayaking, biking, swimming, hiking, and horseback riding. This is another case of me wondering why it took so long to visit somewhere. My friend Kevin M has mentioned it several times, but I never seemed to get over there – until now. It’s truly scenic and I’ve included more images than normal in this post – I apologize if it loads slowly. There’s a lot to photograph there and the variety of landscapes is greater than many places in the area. Hills are rare around here, but this park has them, some over 100 feet high. I made this photo on the hillside above the road by the cabin where we stayed. May 5-11 is national wildflower week and LLSP was doing its part. Several wildflowers were blooming, including Prickly-pear Cactus, Passion Flowers, Lantana, and others. I think we were lucky to see such a variety in bloom. The Passion Flower blooms are supposed to last for only one day. All of the lakes in the park are great habitats for Cypress Trees and Spanish Moss – very scenic and a classic Florida landscape look. The Cypress tree trunks can also be very interesting. There’s a variety of wildlife at LLSP, although not as much as some other locations in Central Florida. For instance, eBird lists 112 species at LLSP vs 293 in Merritt Island National Wildlife Refuge. 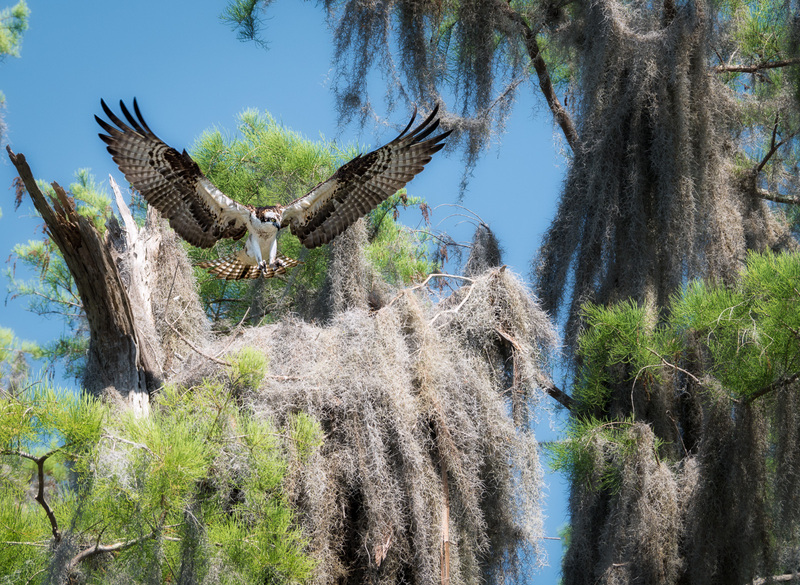 We spotted nesting Ospreys (with chicks / juveniles), Red-bellied Woodpeckers, Cardinals, Black Vultures, Wild Turkeys, Nighthawks, a Swallow-tailed Kite, wading birds, vultures, Gopher Tortoises, Alligators, Deer, Crayfish, grackles and a few other species. Most state parks in Florida seem to open at 8am, which makes early morning photography a challenge. Since we were staying there, we could photograph whenever we wanted. This one is on the western shore of Lake Louisa. Cypress dawn – by Lake Louisa. Tripod/Monopod: Yes – take yours and use it when needed. Lenses: There are so many photo ops here that you could probably make use of every one of your lenses. Macro for flowers, wide-angle for landscapes, long telephoto for wildlife, etc. You’ll have to decide how much to carry and what to concentrate on. Best time to visit: Any time, but of course winter months will be cooler. Late April and early May will be better for wildflowers and nesting Ospreys too. We often heard Ospreys calling. It was fun to watch the parents bringing food back to their very demanding offspring! There’s a nice beach and picnic area on Lake Louisa. If you swim there be careful though, there’s no life guard and there are alligators. The park also is a popular place to bicycle, so bring yours if you have room. The Florida Rambler website has a nice writeup on Lake Louisa and the cabins there. The kayak launch at Lake Dixie across from the cabins is an easy put in. The one at Lake Louisa requires a long carry, so bring a friend or a kayak trolley if you plan to paddle there. You can also put in at the Crooked River Preserve just to the north of Lake Louisa and paddle down to the lake. I didn’t get a chance (yet) to hike the many trails in the park. There are 9 main ones ranging from 1/2 to 5.5 miles and some of these lead to smaller lakes which might be very scenic. The Citrus Tower is close to the park. It was built as a tribute to the citrus industry in the area. There’s a great view from 226 feet up, but a lot fewer orange trees visible now than there were in 1956 when it opened. Cloudy in Clermont – View from the top of the Citrus Tower, looking south along HW27. There are also many restaurants within a short drive from the park if you don’t want to cook in your cabin. Lake Louisa State Park is a relaxing and scenic destination. It seems a world away from busy downtown Orlando. It’s perfect for a weekend get away. If you haven’t been there yet, you should go. I’m very glad we did. Be sure to visit my Lake Louisa set on Flickr to see these and more photos. Lake Louisa set on Flickr. A CFL Photo Op must do! To all Mom’s everywhere, Happy Mother’s Day! Momma Osprey and baby – found while kayaking along the north shore of Lake Dixie In Lake Louisa State Park. The nest looked empty at first. Then Mom flew in and baby popped up.